Pure luck is all we need to win the lottery, but when we are fresh out of it, it may be because we haven’t taken the necessary steps to avoid being scammed. In order to help you avoid being scammed, we detail many common and well known lottery scams and important tips to stay safe when there are so many ways to be conned. As with many industries, there are people which exist within the lottery industry who set out to steal money from vulnerable players. They do this by creating scams which can either be obvious to an experienced lottery player – but unsuspected by a new player – or crafted so well even the most seasoned player would be tricked. In order to ensure this doesn’t happen to you, we take a look at some of the most common scams and how you can avoid them.These scams are the most well known, and you will most likely come across at least one form in your lifetime. 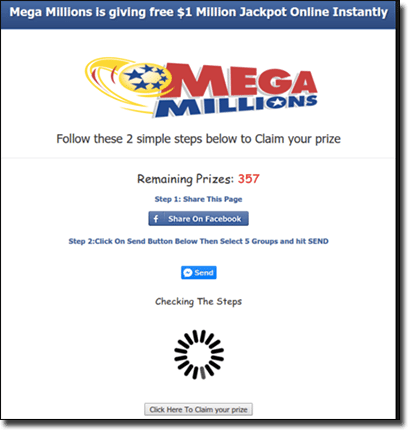 This is considered to be the most common type of lottery scam, where you will receive an email – sometimes to your main inbox and not even your junk folder – where you are told you are a winner. The email may detail a legitimate draw, including the number, the total prize pool and even the correct date, which can indeed mislead many players, or it can completely botch the whole thing with a false lottery operator you are led to believe is genuine. They can then detail you need to pay a certain fee in order to have your funds released securely, or for tax purposes, or they may simply just ask for your personal details and then eventually your financial details. This is where and how they steal your money. This can be a difficult scam to identify as when you receive a phone call telling you have ‘won big’ you can instantly feel elated and shocked. The scam artists utilise emotional reactions by then getting you to make a payment over the phone by extracting your credit or bank details. They will then promise to release the prize to you once the transfer has been complete – but it ends up instead they have stolen your funds. It is easy to criticise someone falling for this in hindsight, but it really is a nasty psychological trick scammers bank on people who just want to have good news fall for. This is increasingly becoming one of the most common platforms for lottery scams. The scam artist will somehow connect to you and either direct message or send links in someway (via their newsfeed on Facebook, tweets on Twitter, etc) to state they have won a prize. Scam artists may provide a link to what looks like a legitimate prize pool and lottery, making the victim truly believe they have won, and then prompt the victim to pay in order to receive their prize – in which they never do. These aren’t as common or believable these days with the use of social media and email, but they can still occur. The scam artists send their victims letters using legitimate letterheads which appear as a genuine lottery, and advise victims to either go online to a link, or to pay a certain way. Sometimes these letters can accompany emails in order to make their scams seem even more legitimate. As you can see there are quite a few ways for these scam artists to get to you, but if you know the warning signs you can avoid falling prey to a lottery scam. If you haven’t purchased a ticket into the lottery, you cannot win a prize. If you receive an email with details you have won, check to see if you have indeed purchased a ticket into a draw via an online account. 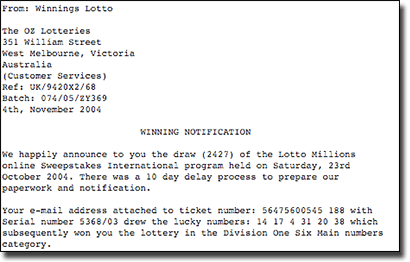 If the email reads it was a lottery which didn’t sell any tickets – this is a scam. There’s no such thing as a lottery where tickets are not sold. If the form of communication (either email, over the phone, via social media, etc) suggests you need to pay a fee in order to receive your prize, this is a huge red flag that it is a scam. While there may be fees and taxes for all authentic lotteries, these are subtracted from your prize – you do not need to pay the fee. The use of poor spelling, grammar and over the top syntax is a huge red flag. If there’s an urgent deadline attached to claiming the prize then it is usually a scam. If there is a strong reliance on ‘confidentially’, ‘security’ and more, as conditions as to why there is a deadline or otherwise, then this is a strong sign of a scam. Snail mail scams generally have poor quality and even if there is a logo and an official address, do your research via an easy Google search on whether it is really genuine. Never send funds to anyone in order to claim a lottery prize. Genuine lotteries do not require their players to pay a fee to claim a prize. Do not share any personal or financial information via the communication methods use to attract victims. For example, do not reply with your details to a lottery email if you do not know the sender. Never click on attachments or links from unknown senders whether it is via email or social media. These can contain viruses to scam your personal details. If you have purchased a ticket via a legitimate lottery operator and have received an email saying you have won, double check by logging into your account directly instead of clicking any email links. Only play at secure lottery operators, such as the many we recommend. Always do your research – you can do a Google search to see if an operator is legitimate by entering keywords such as ‘scam’ and the operator’s name.